"They came. They thawed. They conquered." The animated film Ice Age was released by 20th Century Fox in 2002. The film follows an unlikely trio of characters as they work to return a human child to his family. The film also focuses on the funny antics of Scrat, a saber-toothed squirrel, and his many unsuccessful attempts to retrieve an acorn. 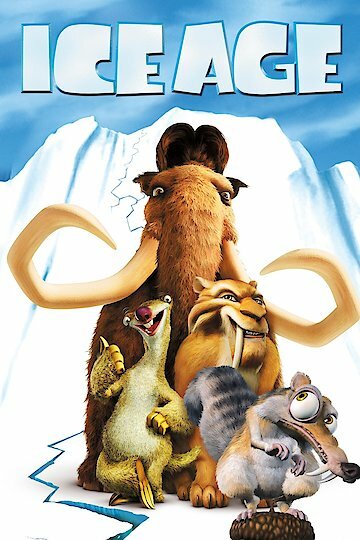 Ice Age starts with all of the prehistoric animals migrating towards the south in order to try and escape the chill of the upcoming ice age. Manny, a wooly mammoth who is voiced by Ray Romano, first meets one of his soon to be friends during this migration. Sid, a sloth who is voiced by John Leguizamo, is trying to escape from two attacking Brontops when Manny comes to his rescue. The two then become traveling companions, much to Manny's chagrin, when Sid decides it will be safer to travel with the much larger and stronger Manny. As Manny and Sid travel towards the south they come upon a human child, Roshan, who's mother fled with the child when their settlement was attacked by a Smilodon pride. The pride, led by the ferocious Soto, voiced by actor Goran Visnijic, is after the baby in order to get revenge against the child's father. Manny and Sid try to return Roshan to his family right away, only to find the humans have left the area. At this point the duo becomes a trio when they encounter Diego, voiced by Dennis Leary, the Smilodon. Diego convinces Manny and Sid to let him help track Roshan's human family, never knowing that Diego is under orders from Soto to retrieve the child for the pride. As Manny, Sid, Diego and Roshan travel to find Roshan's family a friendship begins to form between the animals as they learn more about each other and protect each other on their perilous journey. Soto, who has been tracking the group, attacks before they are able to return Roshan to his family and a fight ensues. All looks lost for Manny and Sid until Diego decides to go against his original pack and protect his new friends. At the end of the film Roshan is returned to his family and Manny, Sid and Diego continue on to the south in order to survive the ice age. Ice Age is a great family film with plenty of laughs and excitement to keep both adults and children entertained. Ice Age is currently available to watch and stream, buy on demand at Amazon, Vudu, Google Play, FandangoNow, iTunes, YouTube VOD online.